Rohan Bopanna set up a mouth-watering semi-final with veteran countryman Leander Paes in the mixed doubles on Day 8 of the US Open, in New York, on Monday. After the fourth-seeded pair of Paes and Martina Hingis moved into the last four stage following a walk-over from the Romanian pair of Simona Halep and Horia Tecau, Bopanna and his Chinese Taipei partner, Yung-Jan Chan, went through the distance before getting the better of Su-Wei Hsieh of Chinese Taipei and Henri Kontinen of Finland in another quarter-final. The second-seeded Bopanna-Chan combine won 7-6, 5-7, 13-11 in 110 minutes on Court 17. Meanwhile, Bopanna also continued his winning run in the men's doubles draw, booking a quarter-final berth with partner Florin Mergea. 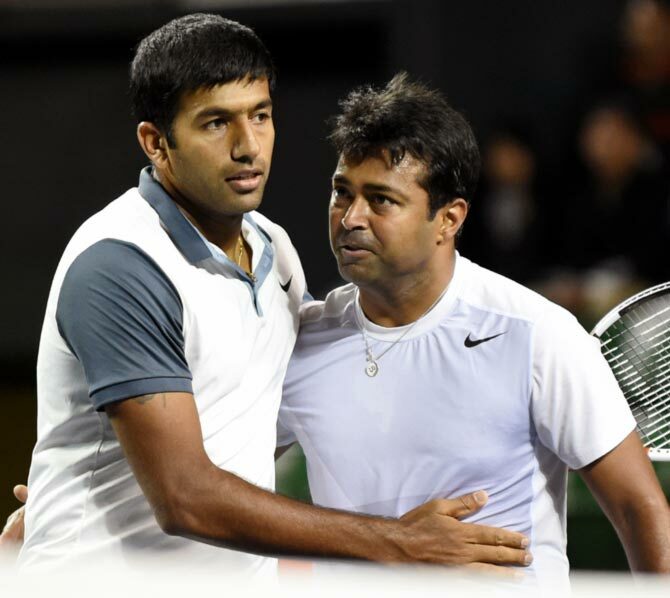 Bopanna-Mergea staved off a third-round challenge from Canada's Daniel Nestor and Edouard Roger-Vasselin of France, winning 6-7, 6-4, 6-3 in a little over two hours. The sixth-seeded pair sent down 10 aces as compared to three by the ninth seeded Canadian-French pair. The Indo-Romanian duo will face Dominic Inglot of Great Britain and Robert Lindstedt of Sweden in the last eight. India also tasted success in the junior girls' section as Karman Kaur Thandi beat Germany's Katharina Hobgarski 6-3, 7-6. Thandi will play Evgeniya Levashova of Russia in the third round. However, Thandi, 17, was unlucky in the junior girls' doubles draw. She and Elini Christofi of Greece suffered a first round defeat to the Australian duo of Kimberly Birrell and Maddison Inglis, losing 3-6, 5-7. No 15 seed Pranjala Yadlapalli, however, fell by the wayside after a 6-7, 3-6 first round defeat to Valentini Grammatikopoulou of Greece.